SpaceX successfully launched a new satellite into orbit to map Earth's oceans today (Jan. 17), but the spaceflight company's bold plan to land a rocket on a robotic ship at sea after the liftoff came up just short, narrowly missing a successful touchdown. The first stage of SpaceX's Falcon 9 rocket managed to reach its landing target, an "autonomous spaceport droneship" called "Just Read the Instructions," but toppled over on the deck, company representatives said. The touchdown attempt came during the successful launch of the Jason-3 ocean-monitoring satellite from Vandenberg Air Force Base in California — the primary objective of today's activities. "First stage on target at droneship but looks like hard landing; broke landing leg. Primary mission remains nominal," SpaceX representatives said via the company's Twitter account, @SpaceX. "After further data review, stage landed softly but leg 3 didn't lockout. Was within 1.3 meters of droneship center," they added in a later tweet. The first stage of SpaceX's Falcon 9 rocket is seen here lying on its side on the drone ship "Just Read the Instructions" after a near-miss landing attempt on Jan. 17, 2016. "Just Read the Instructions" was stationed about 200 miles (320 kilometers) west of San Diego, SpaceX representatives said. 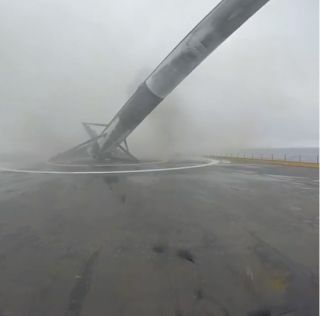 SpaceX had tried such droneship landings twice before, in January 2015 and April 2015. Both of those prior attempts, which occurred off the Florida coast, were near misses as well; the rocket stage hit "Just Read the Instructions" but ended up falling over and exploding on the ship's deck. These landing attempts are part of SpaceX's quest to develop fully and rapidly reusable rockets — technology that company founder and CEO Elon Musk has said could slash the cost of spaceflight by a factor of 100, potentially making Mars colonies economically feasible. The two-stage Falcon 9 blasted off at 1:42 p.m. EST (1842 GMT) Sunday from Vandenberg, rising through a heavy fog. The rocket's first stage separated, then performed a series of three engine burns that put it on course for the deck of "Just Read the Instructions," where it came down about 9 minutes after liftoff. "Definitely harder to land on a ship. Similar to an aircraft carrier vs land: much smaller target area, that's also translating & rotating," Musk tweeted Sunday. "However, that was not what prevented it being good. Touchdown speed was ok, but a leg lockout didn't latch, so it tipped over after landing." The latch failure may have occurred because condensation from the heavy fog at Vandenberg caused ice to build up in the mechanism, Musk added in an Instagram post Sunday. Incidentally, Sunday's touchdown try came at sea rather than on land because SpaceX didn't have approval to come down at Vandenberg, company officials said. While the landing try perhaps generated the most buzz and excitement Sunday, the main goal of the launch was getting the U.S. National Oceanic and Atmospheric Administration's (NOAA) 1,120-lb. (510 kilogram) Jason-3 satellite aloft. If all goes according to plan, Jason-3 will spend about 17 days maneuvering to a polar orbit with an altitude of 830 miles (1,336 km). The spacecraft will make superprecise measurements of sea-level heights around the world for at least three years from that perch, providing "scientists with critical information about circulation patterns in the ocean and about both global and regional changes in sea level and the climate implications of a warming world," according to a mission description. An artist's depiction of the Jason-3 ocean-monitoring satellite in orbit above Earth. More than 90 percent of the heat being trapped in the Earth system by the greenhouse effect is going into the ocean, said Jason-3 program scientist Laury Miller, chief of NOAA's Laboratory for Satellite Altimetry in Washington, D.C.
"This makes the ocean perhaps the biggest player in the climate-change story, but it also helps explain the importance of the Jason mission," Miller said during a press conference Friday (Jan. 15). "Jason allows us to get the big picture in terms of sea-level change in the years to come." "What we're trying to do . . . is build a record of the climate," Jason-3 project scientist Josh Willis, of NASA's Jet Propulsion Laboratory in Pasadena, California, said during Friday's press conference. "The Jason missions are an incredibly powerful tool," Willis added. "Without them, we'd really be turning a blind eye to our oceans and our climate." The Jason-3 mission is a joint effort involving NOAA, NASA, the French space agency CNES and the European meteorology-satellite organization EUMETSAT. This story was updated at 11:40 p.m. EST on Jan. 17.